When the market leader in car bulbs, Ring Automotive, came to Pure agency to help build its profile amongst garages we were excited for the challenge. With extensive experience in the automotive sector we used our knowledge to define and answer the client’s brief, which was to improve awareness of car bulbs and Ring Automotive amongst garages through a creative marketing campaign. As well as generating awareness, Ring Automotive was keen to highlight its levels of service, covering range availability and knowledgeable support staff, while ensuring a typically mundane product was presented in an exciting and engaging way. To position the client as an experienced authority on all things car bulbs, we devised a marketing campaign that was both eye-catching and informative to win the hearts and minds of our audience – The Golden Bulb campaign. As part of this activity, 145 golden tickets were placed into the company’s headlight H7 boxes before sale. 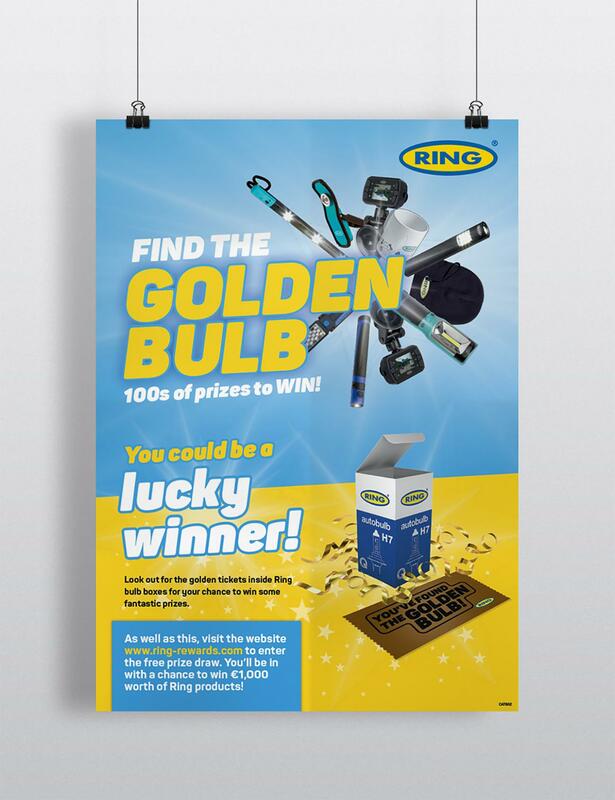 Mechanics and technicians that found a golden ticket were the lucky winners of a Ring Automotive prize, issued through a microsite, aptly titled ‘Ring Rewards’ designed and developed by Pure Agency. Prizes included workshop equipment, dash cameras and branded clothing. The ticket holder also had the chance to enter into a free prize draw for a chance of winning a workshop equipment bundle worth more than £1,000. To spread the word, Pure’s marketing team promoted the marketing campaign through leaflets distributed to motor factors, aimed at mechanics and technicians stocking up on supplies, alongside posters and point of sale materials to display at pay stations. Bespoke emailers were also designed, developed and issued to direct web traffic to the new portal and encourage entries, complemented by press and online advertising promoting The Golden Bulb campaign. This project was a huge success resulting in hundreds of hits to the website over a short campaign period and heightened awareness of Ring amongst mechanics – a glowing success for the Pure Agency team!